"This is a great fritters recipe and you can make banana fritters with it by substituting bananas ." In a large bowl, mix flour, salt and sugar. Pour in milk, a little at a time, stirring to make a smooth batter. Beat in eggs and lemon zest. Core and peel apples, then cut in wedges. Cut each wedge crosswise into thin slices. Toss apples in batter to coat. In a large skillet over medium heat, heat oil and butter. Drop fritter mixture by spoonfuls into pan and cook, turning once, until golden brown. Plate and sprinkle with sugar. Serve warm. 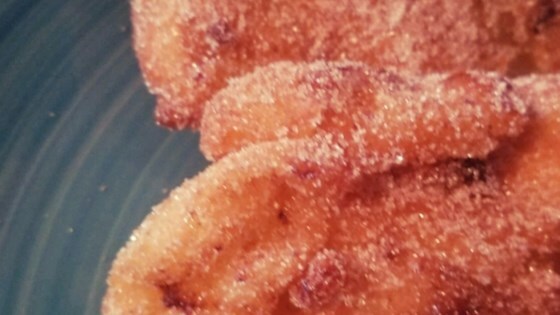 See how to make warm, crisp apple fritters from scratch.